New York: Americans are boringly predictable when it comes to smartphone shopping. Roughly three-quarters of Americans with smartphones own either a Samsung or Apple device. Every other mobile phone maker is competing for scraps. Perhaps the company with the best shot at shaking things up, China’s Huawei Technologies Co., has suffered a big blow to its ambitions to dislodge the Coke and Pepsi of the US smartphone market. For the many Americans who have never heard of the company, Huawei is the top-selling smartphone company in China and the third biggest in the world. Huawei is a fascinating and controversial beast of a technology-and-telecom company, but it’s been largely sidelined in the US over concerns that its telecom equipment could be abused by China to spy or harm US networks. Huawei denies those fears. 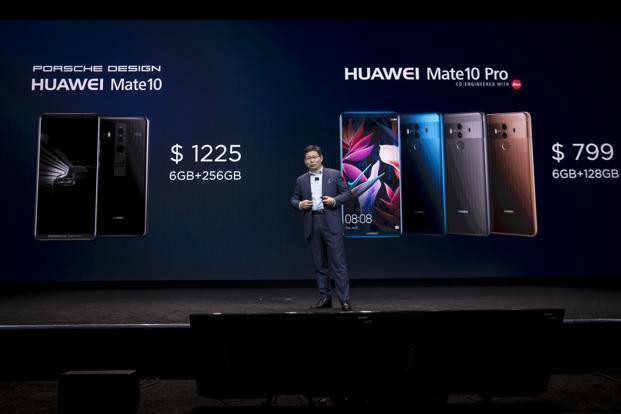 And while it plans to announce on Tuesday that it will sell its newest high-end Mate smartphone in the US for the first time, Huawei has an uphill battle. AT&T Inc. won’t sell the Huawei phone after a sales arrangement between the companies fell apart. (Those Chinese spying fears seemed to have been a culprit.) Mobile carriers such as AT&T and Verizon Communications Inc. sell the vast majority of smartphones in the US. Without the Mate in top phone carriers’ stores and websites, Huawei has an incredibly tough task. Cozy up to Amazon: If Huawei can’t count on sales from the main US wireless companies, then it helps to have another 800-pound gorilla in its corner. None perhaps are bigger than Amazon.com Inc.
Consumers can already buy Huawei smartphones on Amazon, but that’s not enough. Huawei needs to convince Amazon that it’s in both their interests to be aggressive in shaking Americans out of their smartphone rut. It can offer discounted Huawei phones during Prime Day sales. It can pitch Huawei by email to the tens of millions of US Prime members, on Amazon shipping boxes and in its website ads. Maybe Amazon can also—as it does with its own Kindle devices and some Android smartphones—lower Mate prices by offering the phones with Amazon-sold advertisements on the home screens. The idea is to make Amazon shoppers curious enough to break the Samsung or Apple habit. It’s to Amazon’s benefit, too. CEO Jeff Bezos can’t be happy about phone companies selling the vast majority of US smartphones. A motivated partner in Huawei is Amazon’s best shot at luring more mobile sales onto Bezos Beach. Set up shop locally: If the big wireless carriers won’t sell Huawei phones, the company needs to do much more to educate Americans who have never bought a so-called unlocked phone and then separately purchase wireless service for the device. One approach: Open Huawei electronics stores, or stores-within-stores at retailers like Best Buy, and then walk Americans through how to buy a smartphone separate from wireless service. Find alternative mobile phone plans: A number of companies, including Project Fi from Google, Republic Wireless and cable provider Comcast sell a type of wireless service that routes calls, texts and internet surfing over Wi-Fi when it’s available and cellular networks when it’s not. Huawei could team up with one of these relatively fringe mobile players to sell Mate phones with one of these Wi-Fi plus cellular phone plans. There’s no better time to try than now. Advertise like crazy: Huawei has proved adept at marketing the company in places like Europe, where the company sponsors several prominent European professional soccer teams and even the Norwegian cross-country skiing federation. Huawei has become a top seller of telecommunications equipment to European phone companies including Vodafone in the UK, and the company’s marketing efforts have helped lift its brand recognition. Splashing Huawei’s logo at Arsenal soccer matches and billboards in Poland surely has helped, although Huawei’s smartphone sales still remain relatively small in some parts of Europe. All of these sales tactics will be expensive for Huawei. But the company has the resources, with more than $75 billion in 2016 sales. And if the company wants to fulfill its stated mission of becoming the world’s top seller of smartphones, making it big in the US would certainly help. It’s also healthy for Americans’ wallets to have more than the usual choices for both smartphone devices and mobile phone plans. If Chinese spying fears don’t stymie Huawei entirely, breaking the ossified US smartphone market is still extremely unlikely, but it’s not impossible.